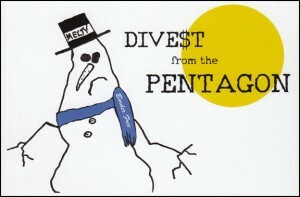 Your tax dollars subsidize the Pentagon’s contribution to global climate change. The Pentagon is the largest user of oil in the world, burning, burning 350,000 barrels of oil per day in 2010. Estimates today raise that to about 1 million barrels a day. An F-16 jet on a training mission ignites more fuel in a single hour than the average car owner consumes in two years. Every hour, the federal government spends about $60 million for the Pentagon, and only about $3 million for the environment, according to the National Priorities Project. U.S. military officials have stated on numerous occasions that climate change threatens U.S. security. So they’re working hard to convince us that with the right “green” technology and policy choices, the military can become environmentally friendly. There is nothing environmentally friendly about massive resource consumption and worldwide deployments. We must demand an end to this grotesque contribution to climate change that comes with the global unrest, death, and oppression. Let’s make that demand with our money, our “green energy,” as Julia Butterfly Hill calls it. The current military budget, now over $700 billion, could be used instead to slow and stop climate change. The government could develop sustainable energy sources for residences and businesses, retrofit houses for energy efficiency, regulate industry, clean up SuperFund and other polluted areas, and more. Individuals and organizations could put that money to work developing local agriculture, creating sustainable economies, installing decentralized renewable energy generators, and cleaning up polluted sites. Postcard created by Jason Rawn. 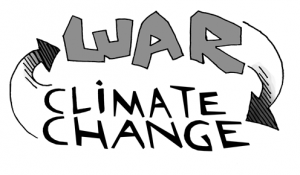 Click for quotes and resources on the military and climate change. The government subsidizes and promotes climate change through the military with money from U.S. taxpayers. About half of each income tax dollar goes to military expenses. 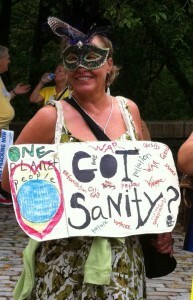 Heather Snow at Climate March 2014. Click for march report. 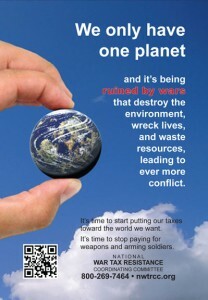 Let’s use our money to save the earth, not destroy it, by refusing to pay for war. You can legally refuse the federal income tax by lowering your taxable income, or you can commit an act of civil disobedience by refusing to pay some or all of your federal income tax or federal excise tax on local telephone service. Thousands of people around the United States have taken a step to boycott the Pentagon by refusing to pay war taxes. They double the impact of the protest by giving resisted taxes to organizations that use it for human and environmental needs, rather than keeping the money for themselves. Find out how you can join us in redirecting taxes from climate change to environmental restoration. Browse the pages on this site to learn more. Left: “We only have one planet” card to hand out. 4″×6″, blank back. Contact the NWTRCC office if you would like some (free) for an upcoming event or to make available in your peace center, office, or at your next meeting. Half-sheet flyer with this text to download and hand out. Download and copy this ¼-page flyer to hand out at rallies and demonstrations. See also our Divest from war, invest in people materials which make the connection between fossil fuel divestment and other types of divestment, and how war taxes are spent.